Liu Chengrui a.k.a. GuaZi, is an artist. What is new is not that it is a commodity, but that today it deliberately admits it is one; that art renounces its own autonomy and proudly takes its place among consumption goods constitutes the charm of novelty. 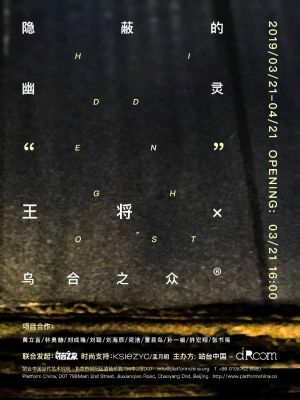 Platform China-droom project space will present the project "The Hidden Ghost" on March 21, 2019 (this Thursday) during Gallery Week Beijing . Jointly initiated by Wang Jiang × The Crowd, it invites ten artists to interact and collaborate. Taking Theodore Adorno's statement as an introduction, the exhibition puts forward a fact that should be faced and accepted: art has been permeated and presupposed by the logic of commodity production since it’s produced. The title "The Hidden Ghost" imitates the rhetoric of "value" in political economy. Through a series of actions before the exhibition, Wang Jiang eventually produces the extraordinary form of the project: the works from the guest artists will be wrapped in a specific way,and displayed to public in a concealed form within a year. Undoubtedly, this resorts to the establishment, negotiation, identification and agreement of the game rules. This process has also been transformed into objects to be exchanged in the art market in the form of installations, texts, and videos. The zero-sum game and positive sum effect implied in this exhibition inevitably points to the win-win situation and game of value between the collaborators. Being packaged or exposed, the fate of these collaborative works will be determined by the collectors. With the theme of cultural materialization, the project presents the relational aesthetics that it generated and developed. Art critic Jerome Araki will be invited as a guest reviewer during the exhibition. The derivatives are supported by KSIEZYC in terms of fashion. We would like to extend thanks to all the friends above. Wang Jiang，planner and producer of contemporary arts. He has been committed to the establishment and operation of independent art space since 2014，engaged in the supervision, planning, host of museum and gallery, as well as the instant comment of exhibitions. Wang Jiang’s art concept is deeply influenced by Pierre Bourdieu’s art sociology, breaking the limitations of identity politics in creation and curation by activating the initiative and relativity of self-identity. He uses skepticism as dialectical tool, employing rich forms and media to pose questions to the status quo of the existing art system. Most of his actions start from the criticism of art system and cultural distinction, exploring the new distribution of conceptual art in Internet media, seeking for the creative practice that influences the existing art system. The Crowd ， an art & design label owned by “Sixpence Art Bank”, which was established in 2017. As a curation team with an experienced advertising background, “The Crowd” has been working on curating and promoting independent art exhibitions and conducting in-depth collaboration with innovative artists and curators while seeking the universality of art, fermenting a lustful relationship between the mass, arts and culture.